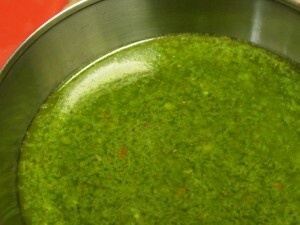 Chimichurri is an Argentinian sauce used as a marinade, as baste for grilling, and as a table condiment. Try it next time you make some veggie kabobs or some baked tofu! This version uses healthy purslane, but if you can’t find any at your local farmers market (or growing wild in your yard), substitute another cup of parsley or some cilantro. No other acid or olive oil? Ok, gotta try this.